Learn how to get more involved with the ala kahakai trail association! We encourage you to contact us and join our email listing to receive monthly updates on the activities we have prepared for this year. Nana i waele mua i ke ala, mahope aku mākou, nā pōkiʻi. He [or she] first cleared the path and then we younger ones followed. As a Native Hawaiian Community, it is important to remember that the trails were created by our kupuna and thereby exist today for our benefit and use. This is one of many reasons why it is important that we constantly strive to protect and care for the trail systems here on Hawaiʻi Island. The trail was built and maintained by our people for generations. However, this responsibility is not a burden, it is a privilege. We often forget the trails in our every day lives, as they are hidden from plain sight. Nonetheless, every time we walk in the physical space that our kupuna lived and breathed, we are reminded of the privilege that we have been given. This is the kuleana that we at the Ala Kahakai Trail Association hope to reconnect and maintain the connections to for moʻopuna of those who came before us and never left. (Above) Senator Hirono at Kiholo with Ala Kahakai National Park Service and The Nature Conservancy. Mahalo to the NPS trail crew for assisting the South Kona team in their efforts of trail clearing at Kauleoli! ʻAʻohe hana nui ke alu ʻia! No task is to big when done together by all! Beach clean ups with Keep Puako Beautiful! Visit Keep Puako Beautiful Website! The view extending into the ocean at Honokaʻope can be seen from the Ala Kahakai and restoration efforts by the National Park Service (NPS) have made this National Historic Trail much more accessible on the cliffside. Portions of the trail were redirected inland for safer travels by hikers. Mahalo nui to the NPS Trail Crew for all their hardwork in maintaining and restoring this trail! Waimea Middle School seventh graders on the trail crossing Waiʻulaʻula. We were fortunate to host this Waimea Middle School seventh grade class as they explored the connections between Mauka and Makai, Ahupuaʻa and of course, Trails. 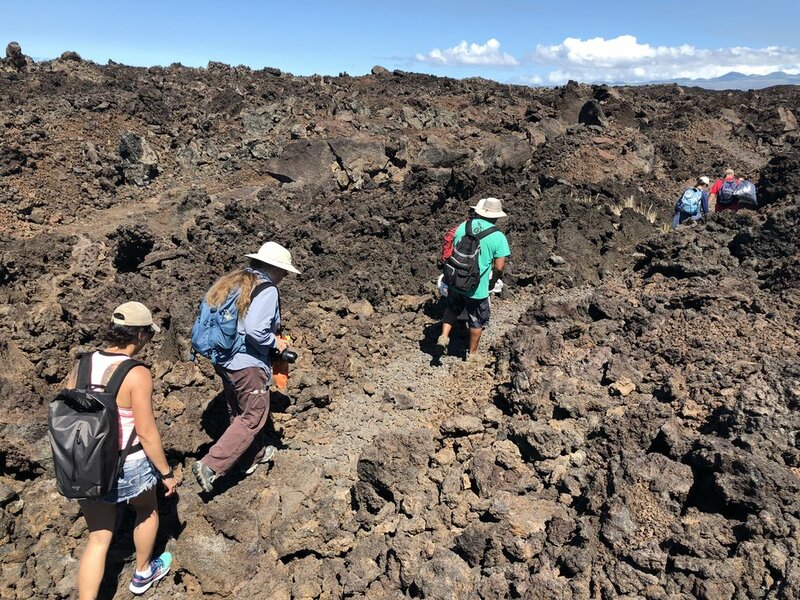 There is no limit to the learning that takes place in a classroom with no walls and these students were able to expand beyond the physical trails, exploring the connectivity of ʻaina and kupuna. Hawaiʻi Community College students joined us for a hike from Weliweli to Wainanaliʻi and back on February 23, 2019. An amazing group! Mahalo! Community Members hike with ATA and NPS on October 21, 2017 for La Hoʻala Ala Hele. The hike from Punaluʻu to Kawa, Kaʻu was full of opportunities to learn and share manaʻo of place and we at the Trail Association are so grateful to have been able to spend time with our Kaʻu ʻOhana. Mahalo piha to them all for welcoming us into their home. The 1871 trail south of Puʻu Honua o Honaunau National Historic Park. The Ala Kahakai Trail Association will be hosting a community hike along the trail once a month. These events are an amazing opportunity to learn about significant archaeological, historical, and cultural information about the wahi pana of Hawaiʻi Island. Please contact crivello@alakahakaitrail.org if you are interested in receiving updates on when and where these hiking events will take place.